Mountain bike shorts are not something you can pick up off a shelf and know they’re the right ones for you. In fact, there are many things you need to consider before you even begin your search. The type of mountain bike shorts you require depends on the kind of mountain biking you are doing. Are you taking part in cross-country riding? What about enduro riding or downhill riding? Your riding style plays a significant role in your shorts. If you are doing cross-country riding, you will not usually be traversing challenging terrain. Instead, you’ll be sticking to those smoother trails which require you to pedal more. Therefore, it’s in your best interests to opt for lightweight mountain bike shorts with more “give” to offer less restriction and more ventilation. Enduro riding, on the other hand, is a little more challenging. You will be riding up and down, testing your body and legs to the limit. As a result, you should purchase shorts that aren’t tight in the joins but are versatile and breathable. Finally, if you are involved in downhill riding, protection is crucial. Your shorts must have large leg openings to allow for knee pads to slide underneath, as well as plenty of inbuilt support. Check out these options below when you’re ready to go shopping. When you want quality mountain bike shorts, it can be challenging to find some that are affordable yet meet the mark for your comfort. When you buy these, you’ll be pleased you did. Even though they are some of the most affordable underwear shorts on the market, they are also some of the most comfortable. They feature both spandex and polyester for better stretch, all the while being lightweight and comfortable at the same time. What’s more, even sweat won’t be a problem. The material combination features moisture-wicking properties for a drier and more comfortable ride every time. However, the benefits don’t end there. When you find yourself riding for hours on end, it’s not uncommon to feel a lot of aches and pains. These mountain bike shorts work hard to ensure the padding stops this from happening. The cushioning component is 3D, meaning it juts outward to provide better cushioning on the seat. These shorts come in various sizes and colors, feature a durable and wide stretchy waistband to deflect sweat, and are sure to become a firm favorite during riding in no time. Cycling can be uncomfortable, but if you own these mountain bike shorts from Urban Cycling Apparel, you’ll barely notice. These shorts are comfortable and convenient in their own right, but they also come with undershorts to further enhance that comfort. 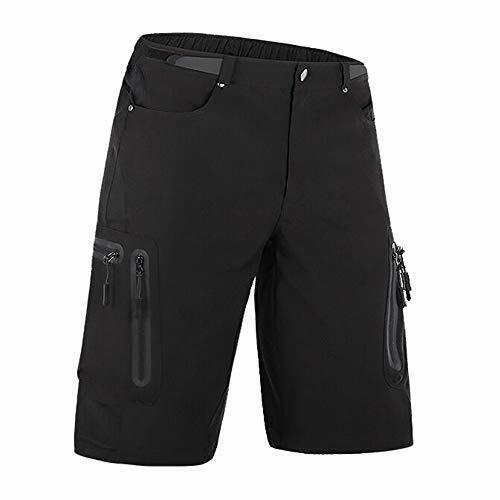 There are many features packed into these mountain bike shorts that are sure to impress. Firstly, they feature dry-fast Cordura material that’s both comfortable on your skin and hard-wearing. They also have zipped pockets large enough for smartphone devices while being double-stitched for even better durability. The undershorts are also something special. These feature a seamless panel to stop chafe, as well as being water-resistant with moisture-wicking properties too. What you will also enjoy about these undershorts is the antibacterial pad to prevent sweat from being a problem, as well as the luxurious comfort they offer. These undershorts and mountain bike shorts are set to impress, so there’s every reason to consider adding them to your shopping cart immediately. 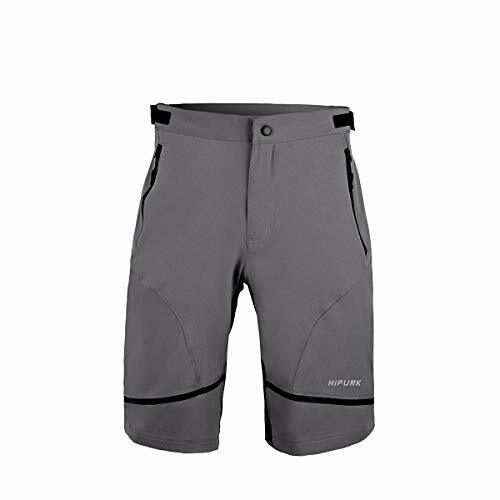 If you’re taking part in cross-country biking and require mountain bike shorts that are breathable, flexible, and comfortable, these will tick all the boxes. While they are durable to last the distance, they are also exceptionally soft, lightweight, and breathable to become firm favorites in no time. What will first appeal, aside from the quality spandex and nylon fabric combination, is how breathable and free they are. Rather than worry about snagging on pedals or losing movement, you can feel like you’re wearing nothing at all. However, you’re well protected where it counts. Thanks to the 3D gel pad in the saddle area, you benefit from cushioning as well as abrasion resistance where you need it the most. What’s more, the flatlock stitching means there is a reduced risk of rubbing and chafing, while the skid strip stops them from moving around. All you need to do is choose a size that fits and get out cycling. If you’re tired of spending a heap of money on mountain bike shorts that don’t last, then it might be time to consider these. As a hardy and durable set of shorts and undershorts, they meet the mark by tackling some of the most familiar mountain biking problems. They feature both lycra and polyamide fabric for stretch and breathability, have a snap closure to put them on quicker, and are lightweight and comfortable as well. Therefore, no matter what terrain you’re traveling, you will find these mountain bike shorts won’t weigh you down. When it comes to comfort, you will find these shorts tick all the boxes here too. With matching undershorts, they feature a 3D gel pad which helps to both keep you fresh and comfortable on your bike seat. They also wick away moisture, feature seven spacious zipper pockets for all your items, and are adjustable as well. There is one velcro strip on each side which enable you to tighten them to your waist or loosen them as you please. These mountain bike shorts from SANTIC may be the answer to all your riding problems. When you find yourself struggling with sweat, discomfort, and lack of cushioning, then it’s time to upgrade to these shorts. Firstly, they feature a decent balance of spandex, lycra, and nylon for better stretch, all the while keeping you fresh and comfortable at the same time. The combination of materials wicks away moisture, reduces the instance of bacteria, and also provides optimum breathability. You will find ventilation is even better thanks to the breathable mesh featuring on both legs of the shorts. However, the benefits don’t end there. There are leg grippers to keep them firmly in place without sliding around, as well as reflectors to make you more visible in low light conditions. And, even after hours of use, you will find they remain comfortable and fresh thanks to the 4D gel pad that adds a layer of protection between your bottom and the seat. While you do need to buy a size up from what you usually are, it’s a small price to pay for unparalleled comfort and coolness on your biking journey. 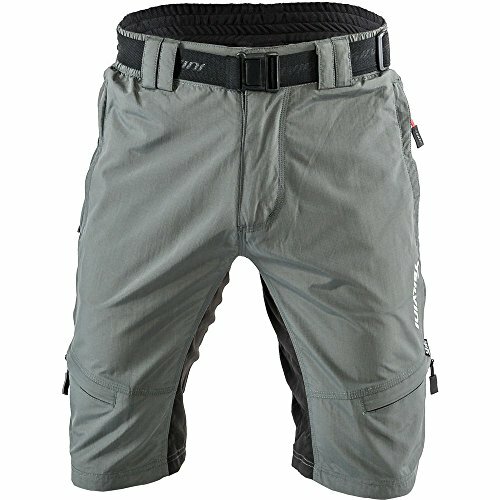 If you require mountain bike shorts that are suitable for all biking occasions, then this multi-use pair will delight. Not only do you get to select from a range of sizes and colors such as red, yellow, and blue, but you also benefit from technologically-advanced features. 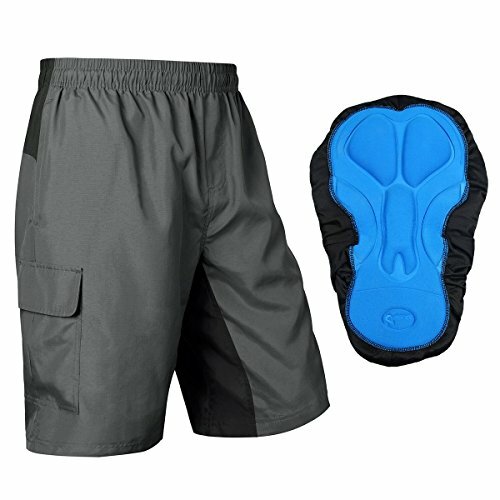 These mountain bike shorts feature polyester and spandex for ventilation and stretch, all the while being durable and hard-wearing at the same time. What’s more, you can wear them for mountain biking, road biking, BMX, and more. The options are endless. What people also appreciate about these mountain bike shorts is how lightweight and comfortable they are. They are comfortable in the hip region with an elastic band, all the while featuring non-slip tape to keep them in place. If you find yourself biking for extended periods, you will also love the addition of the padding. It not only makes your bike seat more comfortable but reduces friction between your thighs too. 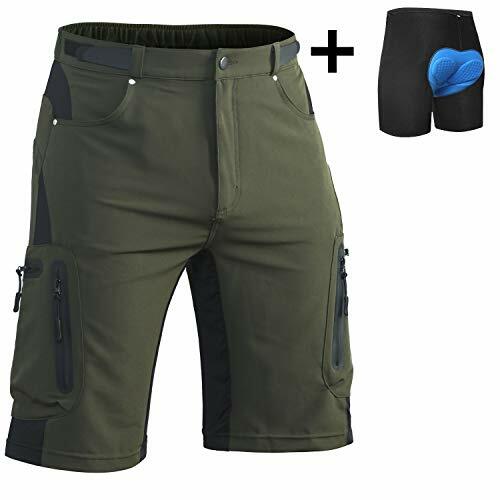 If you want fashionable mountain bike shorts that will be comfortable and breathable as well, this pair is the answer. Not all mountain bike shorts you will come across are multi-purpose, and this can be a problem. You can only wear the majority of them for biking, making them entirely non-functional in any other situation. However, this pair of mountain bike bucks the trend by being suitable for any outdoor occasion. They are comfortable, feature polyester fabric and lycra for better ventilation and stretch, and will be a welcome addition to your drawers. You can wear them while you’re mountain biking, camping, hiking, or even as leisurewear. 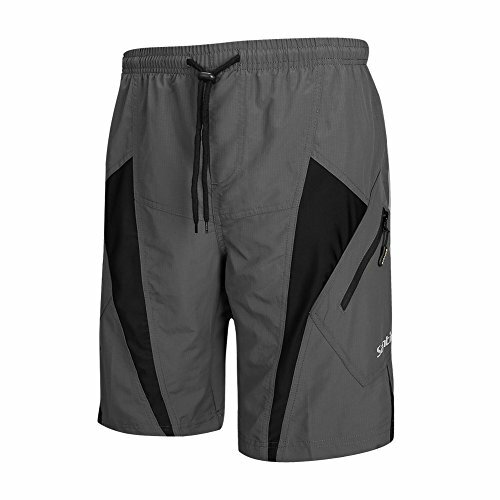 For all occasions, these mountain bike shorts tick all the boxes. Once you pick your size, of which there are many options, you can then set about reaping the rewards of all they have to offer. They are quick to dry when you get them wet, are water-resistant, and wick away sweat as well. Even better, they’re stretchy, which means you won’t find yourself uncomfortable when you wear them for extended periods. When you use these shorts, you will also enjoy the seven pockets. You don’t have to concern yourself with finding room for your mobile phone or keys any longer. Everything fits safely inside. What’s more, they have waist tabs for adjustability, loops for a belt, a snap closure, and velcro straps. These mountain bike shorts are everything you could need and more. Versatile mountain bike shorts are essential, which is why you’ll enjoy everything these from CyCorld has to offer. Rather than opt for everyday casual wear or lycra shorts without any functional components, you can make your journey that much more convenient with these shorts. They feature polyester, spandex, and PVC fabric for durability, comfort, and stretch, all the while being effortless to put on thanks to the button fastener. However, the benefits don’t end there. Because they have a premium mixture of fabrics, you can enjoy how water-resistant they are, while drying quickly and wicking away sweat and moisture at the same time. They feature seven pockets for various devices you don’t want to leave at home, and all of these pockets have zippers. There is one in the back, four in the legs, and two in the front. As a result, you can take your mobile phone, keys, money, and more on your journey. If you’re a casual rider, you will no doubt want mountain bike shorts that will be comfortable, but you can wear for other events as well. These mountain bike shorts from Club Ride tick all those boxes. While you can wear them for comfortable riding, you can also wear them at home or in town without a problem. In essence, they are a smart pair of shorts that once you own, you’ll never be without. They feature a stunning woven plaid design, are lightweight and durable, and even have zip and drop-in pockets in both legs. As a result, you can comfortably house your phone and wallet without worrying you don’t have enough space. 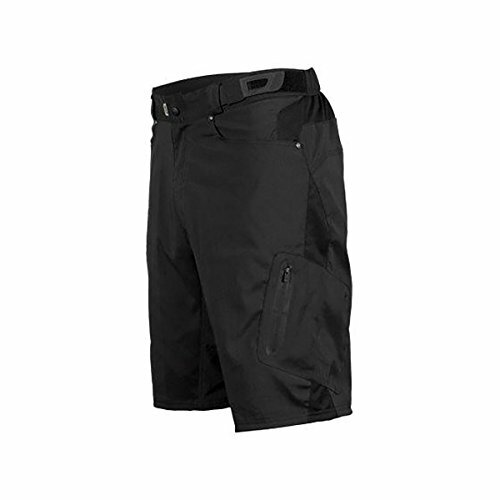 To add to the comfortable aspect, these mountain bike shorts also feature comfortable poly fabric as well as spandex. They offer plenty of stretch without being too noticeable if you aren’t on your bike. Enjoy the velcro waistband for easy adjustability, as well as the gusseted crotch region and reflective accents. These shorts will impressive all prospective purchasers.